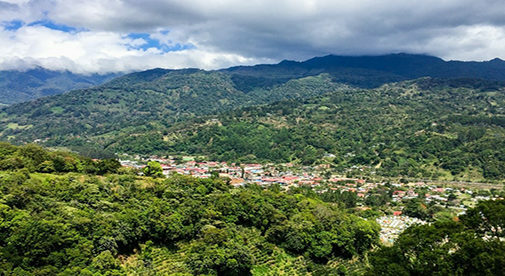 Boquete is located in a lush green valley about an hour's drive from the city of David, Panama. When Michael and Heidi Rehm moved to Boquete and purchased a restaurant, they knew nothing about the customs, culture, or food of Panama, and nothing about owning and running a restaurant. However, being adventuresome and enthusiastic (both having lived in Antarctica for many years), they jumped in with all four feet and set to work. That’s how Mike’s Global Grill was born. Funky decor. Great international food. Live music. These are just a few of the features of their extremely popular eating establishment in downtown Boquete. “We bought an existing, under-performing business but made it blossom. It took a few years to make it profitable, but it now allows us to support ourselves and live in a vacation paradise,” says Michael. The entire venture started from a vacation they took to Panama. While there, they heard about a restaurant that was for sale in the town of Boquete. So, curiosity piqued, they checked it out. The restaurant was old, small, and quiet, but they immediately recognized its potential, made an offer, and instantly became restaurateurs. They love everything about Boquete: year-round spring-like weather; a stunning setting; being nestled in the seat of a long extinct volcanic crater; lush forests; a profusion of rampant blossoms in shades of yellow, white, red, magenta, and lilac; and all this watched over by majestic Volcán Barú, the highest mountain in the area. Not being as large as David, Colón, or Panama City, Boquete has a friendly small-town vibe, which Mike and Heidi appreciated. Also significant to them was the large expat population who immediately made them feel welcome. In spite of knowing no Spanish upon arrival, they quickly acquired this skill with the willing assistance of local Panamanians, who smiled with twinkling eyes, but patiently taught them the basics required. The couple rents a small house on a hectare of land in Boquete for $300 per month. There they can relax and take their dogs for long runs. In their down time they go to the beach or help out with the local juvenile baseball teams. Mike and Heidi held raffles and other fundraisers through the restaurant and have managed to outfit their teams, thereby allowing them to participate in Chiriquí tournaments. “Heidi and I really enjoy supporting the kids here in Panama,” says Michael. The couple are now well settled into life in Boquete. They have a terrific rapport with locals, expats, and travelers, and have become a vital part of the community. The restaurant has become extremely popular as well. They have recently celebrated their seventh year in business and have signed a nine-year extension on their lease, assuring them of security for the future. Michael and Heidi agree that their adventure has been fun and challenging, and neither of them would trade their life in Panama for anything.